My Connection Collections feature elegant symbols meant to serve as visual reminders (talisman) to be “mindful” or concious of our thoughts and intentions as they manifest the world around us. It is so easy to get caught up in the flurry and chaos of life that a beautiful adornment, infused with an intention, serves to ground you; to remind you to nurture your soul. It is when we are whole ourselves that we are happiest and can best serve others. Having explored a wide array of creative endeavors throughout my lifetime, I utilize various nuggets of expertise to compose these expertly constructed and unique designs. My comprehension of 3-dimensional plans that was honed while studying architecture is fundamental as I plot and plan the forms first on paper, followed with practice parts to study the proportions and functionality. I also use my knowledge of pattern-making and draping, derived from my extensive background in sewing, to be sure that I achieve consistency of my components and true wear-ability in my final product. Since 2007 I have been instructing others in the art of metalsmithing. As my students fulfill their passion to create – I am called upon to problem-solve the construction of their projects. With the extensive number of issues I have alleviated over the years, you can rest assured that my jewelry is designed to be durable and stand the test of time – possibly even become a family heirloom to be passed on to generations to come. 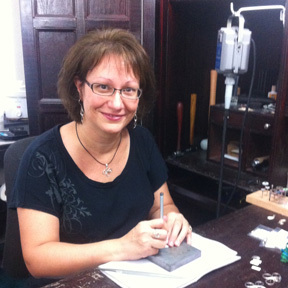 With ten years of teaching project-based jewelry classes for adults in a supportive environment, Jen is the perfect instructor to help you explore your creativity.